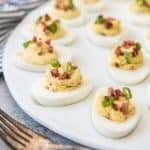 Classic deviled eggs get a savory update with chopped crispy bacon and fresh green onion in these Bacon Green Onion Deviled Eggs. Perfect for using up your leftover hard-boiled Easter eggs or taking to summer BBQ's and cookouts! Carefully peel and rinse the hard boiled eggs. Slice each egg in half lengthwise, and place the yolks in a bowl. Mash the yolks with a fork, then add the mayonnaise, horseradish, optional vinegar if using, mustard, salt, pepper, green onion, and bacon. Stir together until creamy and combined. Transfer the yolk mixture to a plastic zip top bag, then snip off one corner and pipe into the hollows of the egg whites. Garnish the eggs by sprinkling with extra crumbled bacon and chopped green onions.